It was during a lunch break in my junior year of high school that I received this message from Roger. I distinctly remember repeatedly reading these words in utter disbelief. That disbelief then turned into tears, followed by rereading the letter, calling my parents about the letter and then back to rereading the letter. In no way did my prose warrant a note from the man who inspired me to write. But he did this. Something in Roger compelled him to reach out, irrevocably altering the course of my life. I know that reads as sentimental hyperbole, but it's the truth. The idea that my writing would ever exist on the same site as his is still something I'm trying to wrap my head around. 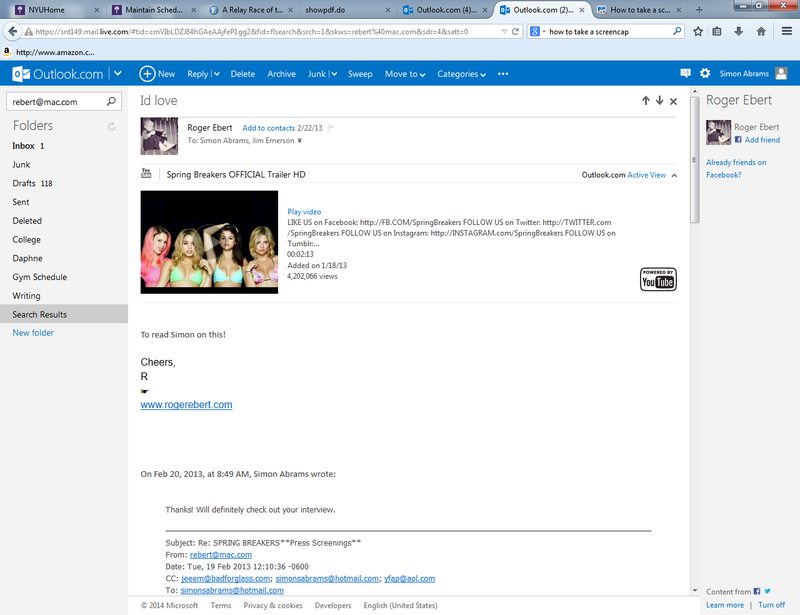 Every success in my professional career can be traced back to Roger's inimitable work, tireless support, and yes, this email. Thank you, Roger. Quintessential read: "The Woof of the Wolf of Wall Street"
I used to take these wonderful comments with a grain of salt, figuring he said such nice things to everyone. Later I realized he did indeed praise many people, but he meant every word. And, with that I feel a greater sense of obligation to fulfill what he called me to do and be. Quintessential read: "Remembering My Father's Face"
The first one makes me emotional for including such a heartfelt compliment from a writer I admired so much. Like I wrote before, it's like being an aspiring poet and suddenly getting compliments from Neruda. The second one reflects Roger's sensibility, his empathy. The way he not only acknowledges the fact the piece I wrote is deeply personal, but relates to it not only as a writer, but as an orphan himself. Quintessential read: "Utterly Modern: The Charisma of Barbara Stanwyck"
Quintessential read: "Ever Try To Make A Film Critic Smile During Award Season?" This was part of an ongoing joke between myself and Roger, one of many we shared during a transition phase in his life. That his sense of humor was stronger than ever and that he could find time to encourage a hometown colleague was an inspiration not only to my writing but also a reminder to keep those same spirits up to those close to me with similar afflictions. 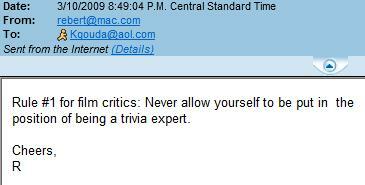 The differentiation between knowledge and trivia are important distinctions for a film critic. Especially for anyone who dared to challenge Roger's. A RogerEbert.com piece: "Art Is An Act of Violence: An Interview with Nicolas Winding Refn"
A RogerEbert.com piece: "Moving Through Empathy: On Life Itself"
Quintessential read: "The Great Movies of My Childhood"
He was enormously kind in his e-mails to me. Now, having grown up, I wonder if he really did like all of my work as much as he said he did, or if he was simply being nice to a hopeful young boy. I think it doesn't matter very much--he was being encouraging. He was nurturing potential. That was just what he did. I wish he was around to watch me grow a little more so that he could be more critical of my work, and so that we could have conversations that didn't revolve around our appreciation of each other. I check my e-mail much, much less now because there are no more "From Roger"s.
A RogerEbert.com piece: "The Ghastly Joys of Johnny X"
In 2013, I edited a book called World Film Locations: Chicago and, as soon at it was finished, before it had even been printed, I sent a PDF to Roger. He read it immediately and, instead of replying to me directly, he sent an email to a few select friends and family members, and CCed me in. He shared the PDF and his feelings about it. I know that others who corresponded with Roger felt as I did: it was hard to understand why he would want to talk to me at all. The benefits to me of knowing him were obvious; the benefits to him of knowing me were not. 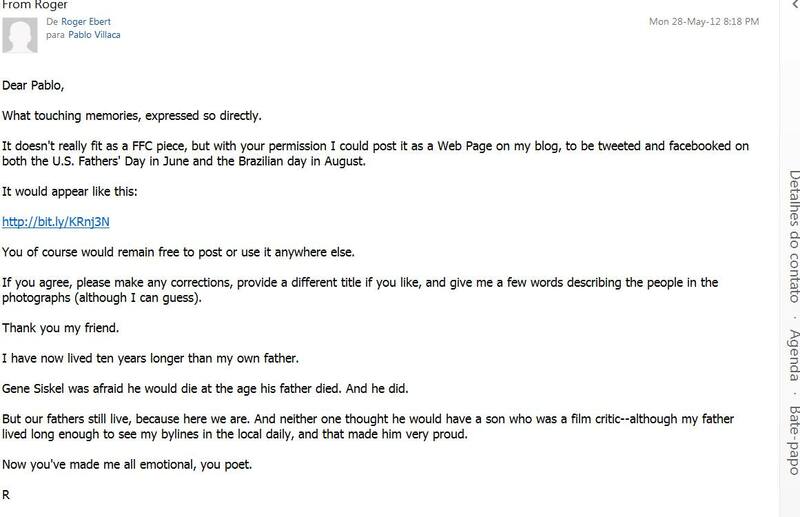 I love these email excerpts because they show how much joy the connections he made online, particularly to his Far-Flung Correspondents, gave to him. A RogerEbert.com piece: "Drinking Buddies"
I wrote a piece on Mandingo, where I quoted Roger's zero-star review. Roger read it, and this was his response. As a lover of Blaxploitation, a topic Roger and I discussed a few times, this was very informative for me. 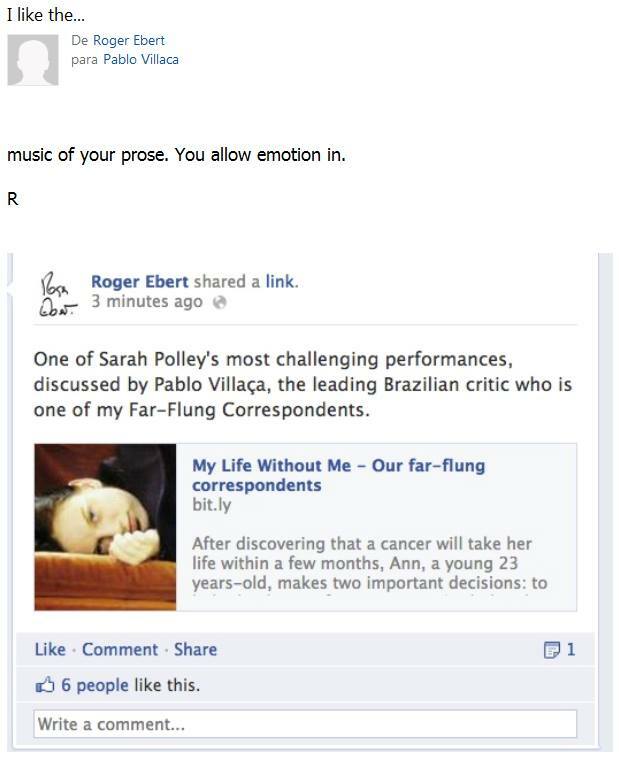 A RogerEbert.com piece: "Translating For My Mother"
I am very aware of how my consonant-heavy name is hell to pronounce and spell for Western speakers, and I loved that it was always spelled impeccably in Roger's E-mails, except for this one occasion. 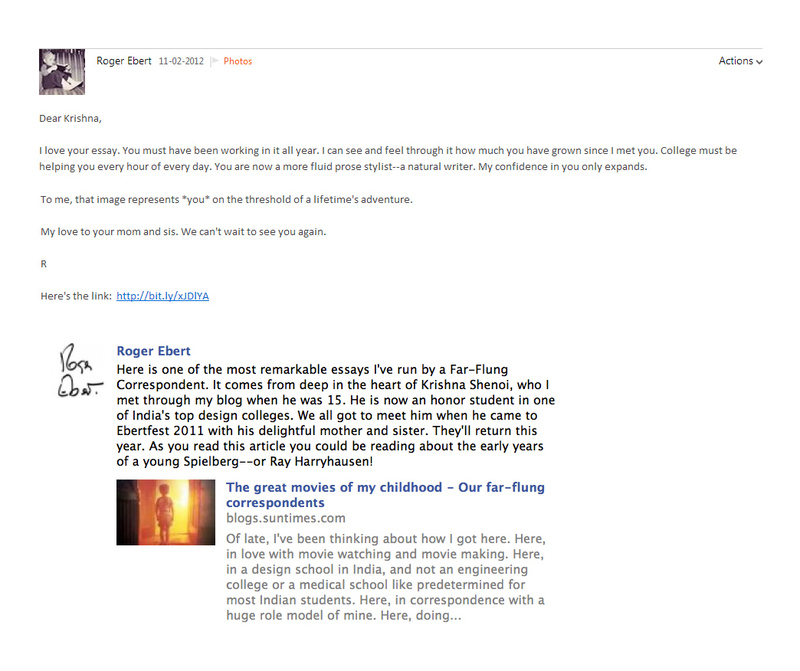 A RogerEbert.com piece: "An Act of Nutty Filmmaking: The Act of Killing"
This is the last personal e-mail between Roger and me. I read this e-mail again after the news of his death came in, and I read it again after watching Life Itself. Even when he knew that the third act of his life was about to be finished, he kept working while somehow finding some time for encouraging me and other writers, and his last months shown in Life Itself made me appreciate his generosity more than ever. I think I have said this many times before, but thank you, Roger. A RogerEbert.com piece: "Should JFK Even Had Been Made?" 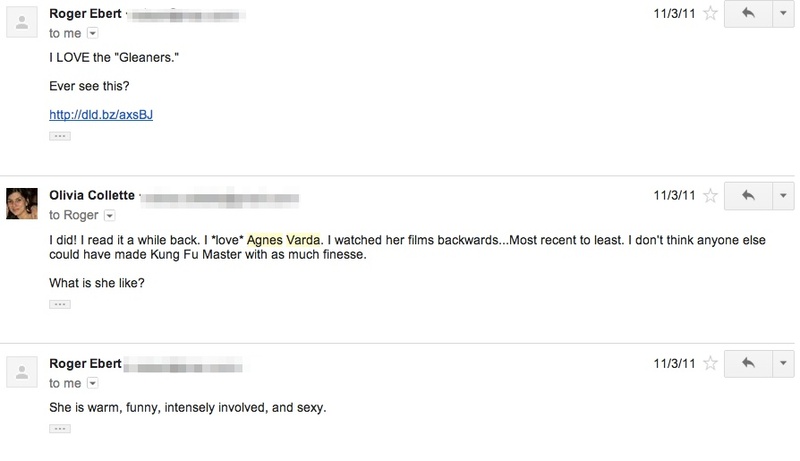 Roger wrote me the following e-mail before he really knew me, in regard to some suggestions I sent for his Little Movie Glossary. A RogerEbert.com piece: "Interview: William Friedkin On The People vs. Paul Crump"
A screenshot of an email Roger sent me following my review of "Something's Gonna Live." Needless to say, I cherish this email. A RogerEbert.com piece: "Why Video Games Are Indeed Art"
That’s what I miss most about Roger: he was a uniter. The people he brought together would run through walls for him, because of how he genuinely cared for them and what they cared for. This was true whether it was on Twitter, Facebook, or in person, and everyone I have talked to about his unique quality all respond with the same seven words: “I don’t know how he did it.” However you did it Roger, you did it effortlessly. Quintessential read: "The Most Important Thing Roger Taught Me"
Next Article: Friends & Memories: The Los Angeles Premiere of "Life Itself" Previous Article: Hamptons Film Festival Q&A with Chaz Ebert and Alec Baldwin on "Life Itself"